1Assistant Professor,2Associate Professor. Department of General Surgery, Prathima Institute of Medical Sciences, Karimnagar. 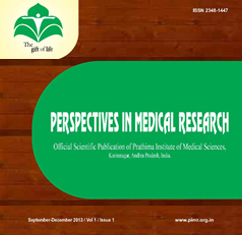 Address for correspondence: : Dr Jayaram Adepu, Associate Professor, Department of General Surgery, Prathima Institute of Medical Sciences, Karimnagar, Telangana. 505417. Background: Laparoscopic Appendectomy [LA] is widely practiced than Open Appendectomy [OA] for the management of acute appendicitis1. It is still unclear in rural settings which procedure is more preferable. Aims and Objectives: The current study was done to compare the safety and the advantages of both the procedures in rural settings of Telangana state. Materials and Methods :One hundred and eighty patients were randomly divided into two groups, OA [Open Appendectomy group] and LA [Laparoscopic Appendectomy] group. Socio demographic parameters, primary outcome measures of the patients such as post operative pain, wound infection, hospital stay, operative duration, cost of the procedure were collected and analyzed. Percentages were calculated for categorical data, numerical data was represented using mean ± S.D. Chi square test was used for comparing categorical and numerical variables. Results:After randomization, 90 patients were in group OA, 90 patients were in group LA. The mean duration of surgery was 32.67 ± 5.229 in OA and 47.25± in LA, pain scores were less in LA than OA. Cost of the surgery was more in LA [mean average Rupees 21,453] over OA [mean average Rupees 12,865]. Conclusion:LA is safe and superior to OA with respect to lesser pain in postoperative period, less wound infection, earlier return of bowel sounds, short hospital stay and better cosmetic look. The cost of the procedure has big impact over patient’s socioeconomic conditions in rural parts which should be addressed by health care providers.